When we were looking for someone to share their cooking expertise, knowledge and experience with us and advise on all things flame cooking, we didn’t have to look very far. With a shared passion for cooking outside, over flames and alongside good company, we knew of a local chef that would do just the job. 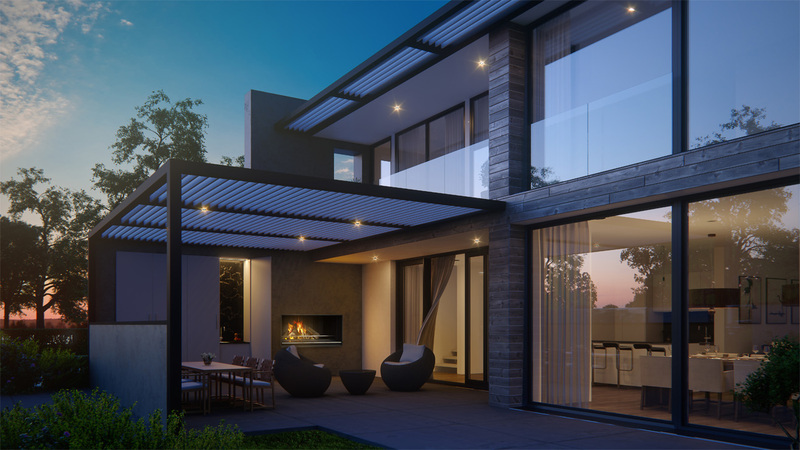 We got in touch with award-winning Dunedin chef Greg Piner who didn’t need much convincing to help guide us in the development of Escea’s new Outdoor Fireplace Kitchen. With an impressive career history spanning 20+ years working in some of New Zealand’s leading restaurants, Greg’s passion for his craft is clear. Highly regarded by his peers and well-known in the Dunedin food scene, the way Greg talks about his love for cooking is truly genuine. 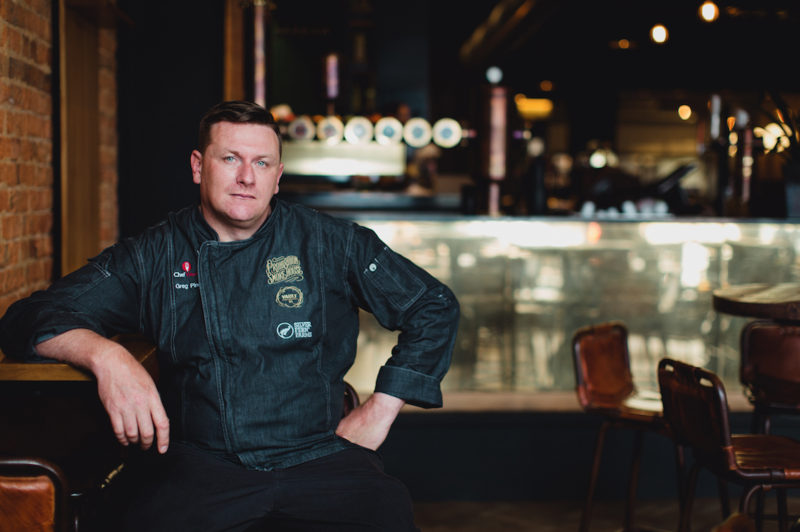 Working in big name restaurants like Millbrook and Blanket Bay in Queenstown, to Mikano in Auckland, Monteith’s Brewery on the West Coast and now as Executive Chef at Vault 21 and the Prohibition Smoke House in Dunedin’s Octagon, Greg is as humble as it gets. With numerous awards under his hat too, Greg says that besides having his baby daughter, his career highlight is winning the “Battle of the Pacific” culinary competition at Australia’s premier food trade exhibition. And now, seeing his students succeed is one of his biggest accomplishments yet (his Commis Chef at Vault 21 was just named New Zealand Commis Chef of the Year). 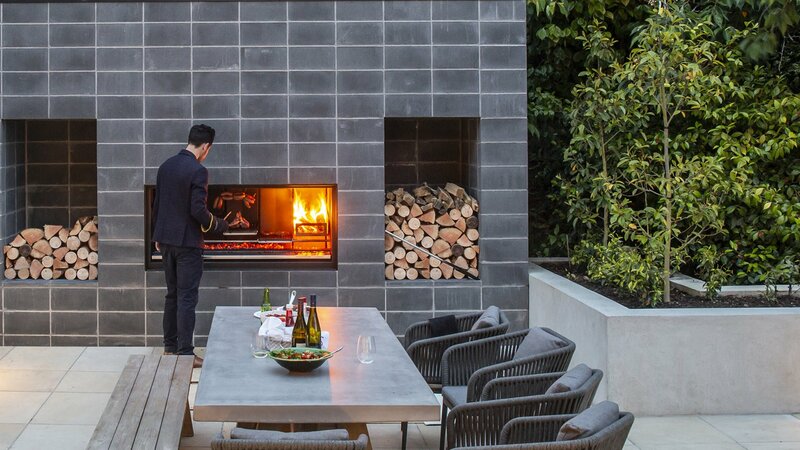 And this is precisely what drew Greg to Escea’s Outdoor Fireplace Kitchen. Escea’s EK Outdoor Fireplace Kitchen in Cooking Mode. Greg was enlisted by Escea engineers to advise on all things flame-cooking with the EK– what heights and levels the grills should be, what fuel types bring out the best flavours and of course, what types of food are best to cook on the EK. The beauty of flame grilling is not only about the choice of ingredients or cut of meat, but the grills and fuel type play a big part too. When melted fat from the steak drips down into the grill, it catches fire and gives off an aromatic smoke – as the smoke floats up through the grill, it permeates the meat and locks in a rich umami flavour. Plus, the 13pt grill-tray levels on the EK mean that meat can be seared and sealed, cooked and rested all in the Fireplace Kitchen, simply by moving the meat further away from the direct heat. 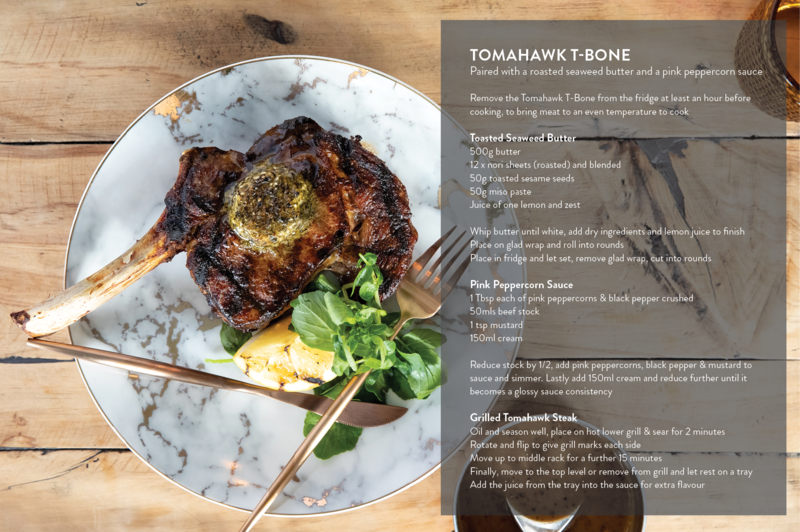 So with all this in mind and Greg's wealth of experience in the kitchen, Greg set out to create a versatile dish that would utilise the full capacity of the EK and create the ultimate flame grilling experience. Wood smoke gives an earthy, smoky flavour and Greg says, “cooking anything with a bone works really well over flames,” so the Tomahawk T-Bone steak was an easy recipe for him to choose, ensuring that every element of the recipe and cooking process shows off and enhances the flavours typical with flame-grilling. When asked about the sauce, Greg says “you can’t go past the marriage of peppercorn sauce with a good quality cut of meat,” and is also a nod to his love of Asian cooking and his favourite Chinese Classic Pepper Beef Stir-fry. The nori butter was added to further enhance the “meaty flavour” of the steak and combined with the freshness of the watercress and lemon, the dish is as mouth-watering as it sounds. And of course, Greg insists that a nice glass of red wine around the fireplace is a must, finishing off the night with good company under the stars. Best piece of advice for the home flame-grilled chef? It’s about the full experience, not just the food. Make sure you have a good base for the fire – once you have this, it’ll be plain sailing from there. Best types of food to cook on the EK? Meat-wise, anything with a bone works really well as does cooking with foil (try wrapping a whole fish in foil and add some chilli or truffle butter). Better still, experiment and try hanging some pork ribs, butterflying a whole chicken, or even a pizza stone sitting across two grill trays – anything goes, so just have fun. When it comes to veggies, drizzle some olive oil and garlic over corn and nori, baby carrots, vine tomatoes, courgettes, eggplants or onions cut in half with some garlic butter. Best drink to pair with a flame-grilled meal? Local wines like Chard Farm, Akitu in Wanaka or Bannockburn’s Mt Difficulty. For beer, go with a nice and cold Emerson’s Bookbinder. Your essentials for outdoor cooking? Make sure you have the quality staples like salt, pepper, olive oil, garlic, chilli and butter. As the fire will be super-hot, you’ll need long tongs and a fork for knowing when the meat is cooked (when the juices run clear) and of course, a can of beer or nice glass of red wine. Escea’s EK Outdoor Fireplace Kitchen in Fire Mode. To learn more about the EK Outdoor Fireplace Kitchen, see here.